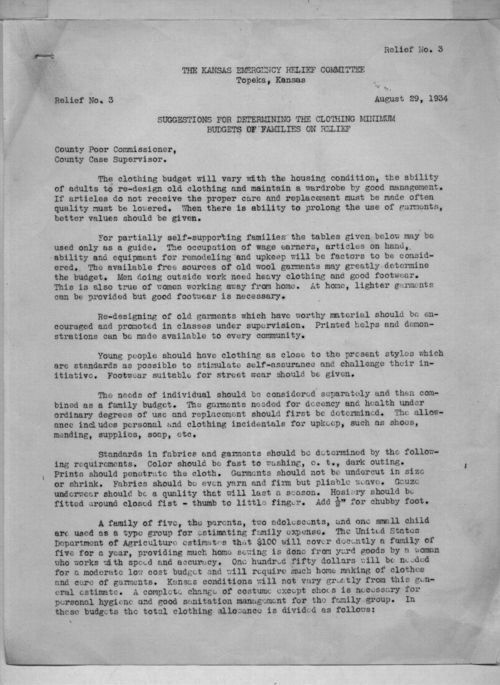 This bulletin of the Kansas Emergency Relief Committee (KERC) includes information about the clothing needs of poor families on relief during the economic depression and drought of the 1930s. It includes a number of charts, including minimum budgets for each family member and the number of each clothing article suggested for each individual. Charts are categorized by gender and age. This is one of the few sources providing detailed information about clothing; the detailed charts about clothing for girls and boys ages 12-16 would allow students the opportunity to see what their own budget may have been like if they had lived in the 1930s. This document lends itself to class discussions revolving around the material goods and daily existence of Kansans during the depression.